Did you bring the travel chess, or the regular chess? Neither, I brought my Switch. Before you get mad, I have Chess Ultra on my Switch, a solid chess game that can be played on the go or hooked up to the TV. Disaster averted. 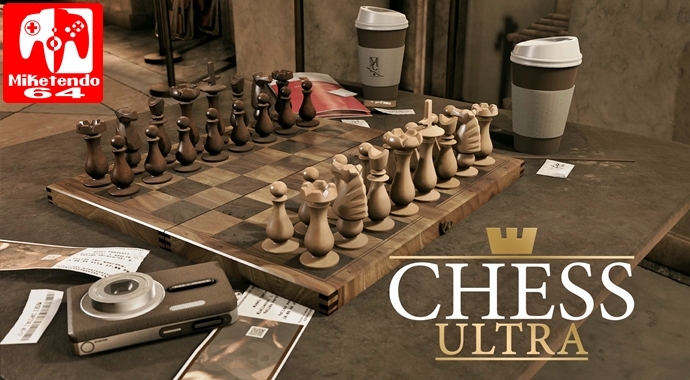 Ripstone Games’ Chess Ultra plays a fundamentally good game of chess, but the Switch version suffers from a low resolution that can make it genuinely tricky to figure out exactly what piece is what when played with certain sets. It is easier when played on your TV, as the larger image lets you see the pieces more clearly. When played in handheld mode, however, the pluses of touchscreen control and portability (it’s like its own little chess set when placed down flat) are somewhat negated by the small size of the screen and the game’s low resolution – it looks like it is constantly in soft focus. This issue isn’t helped when you play the game using the Fire & Brimstone set, especially on the Gomorrah setting, which displaces your traditional chess pieces with creepy looking medieval demons. I’m unsure as to why the game is displayed at such a low resolution, as even the detailed and vibrant backgrounds don’t seem too much for the Switch to handle. Oh well. The game is playable in handheld, especially when using your more traditional chess sets, colour schemes or even checkers. There are a few sets to choose from, a few neat backgrounds and even a few different colour schemes available for each set. Indeed, the options in Chess Ultra are plentiful, but can feel limited on the go when you can’t properly see the defining features of each piece. You can choose between ten difficulty settings (all Grandmaster approved of course), set time limits (including the excellent Blitz mode that gives each player just five minutes to make all of their moves) and play single games against AI. You can face off online against anyone, friends or last played – even against people playing on other consoles – it’s great for those looking to set up regular sessions of chess. But wait, there’s more. You can create online tournaments, play games where you have to make a move at least once a day (great for people without much time) and the whole time you will move up and down in ELO rankings depending on your success. There’s a leaderboard that’s spread across all platforms and even tournaments run through the developers that pairs you off against just about anyone. If that is not enough, there’s a fairly detailed tutorial and 80 challenges to tackle. You will spend the majority of your time facing off against others in the smooth online offering, facing off against family or friends with a joy-con each or just honing your skills against the AI, who can be tough. You’ll likely breeze through against the lower level opponents, but I’ll be amazed if you can beat the AI from level four and up, or maybe that’s just my lacklustre chess skills talking? Thankfully, if you play online, the game will try to pair you with someone at a similar ELO ranking to yourself. Playing online is the most fun you’ll have, and let me tell you, I’ve played through some tense affairs already. If, however, you want to improve your skills even more, then you should attempt the pain that is the challenge mode. There are 80 challenges to fight your way through, with eight sets of ten similar ideas. The first set puts you in the seat of famous chess battles from across history and challenges you to win within a set number of turns after a certain point in the classic nail-biters. The rest of the challenges you’ll try to beat are based entirely on winning via check-mate within a set number of turns (but not based on real life games of chess). You’ll begin by trying to win after one turn, then two, then three, then… you get the idea. These challenges are tough, but they will help you to finish games off – a key part to any chess game as it can prove quite difficult to actually win a game. Chess Ultra could very well improve your chess skills, even if you can’t quite tell what piece is what when playing the game in handheld mode. Chess Ultra gives you plenty of quality options to pop your chess cherry. The ability to play the game wherever and whenever is the Switch’s killer app, but it, unfortunately doesn’t look fantastic on the small screen and you’ll struggle to see exactly what piece is what, especially if you’re using the less traditional chess sets, or chose to use odd colour schemes (such as the pointless copper and tin which doesn’t distinguish between players). When played online on the big screen, Chess Ultra plays a perfectly fine game of chess and you can play it anywhere, like an actual chessboard, but you just have to look closely sometimes to figure out the pieces that are left on the board.